Calculate installation prices for Vinyl, Fiber Cement, Cedar Clapboard & Shingles, & Aluminum Siding. Free Siding Calculator tool helps homeowners estimate residential siding prices. To calculate siding installation price, simply plug-in your home foundation measurements, number of floors in you home and number of windows and doors that will need to get trimmed with flat-stock aluminum coil. Siding Calculator v. 1.1 features: Progressive siding pricing algorithm accounts for smaller residential siding projects (under 700 sq. ft.) – prices are adjusted to account for smaller size job. Now you can also estimate cost of installing aluminum copping (aluminum trim) around windows, doors, bay windows, etc. It is also possible to calculate soffit and fascia installation cost for vented vinyl soffits and aluminum fascia trimming. * Siding prices are estimated, and will vary based on your geographic location, local market conditions and and other factors, such as fluctuating costs of roofing materials. Although vinyl siding prices are not directly related to oil prices, they seem to go up when oil is up, and usually do not drop back down. In case of cedar siding the clear-coat staining or painting is not included in price calculation. ** Siding prices are calculated based on the assumption that you are working with a reputable, fully licensed and insured siding contractor. Although the General Liability Insurance for siding installation is rather inexpensive, the Worker’s Comp insurance is what the contractors usually skip on. It is important that the information that you plug into the siding calculator is more or less accurate – this way you will get the best estimate of siding installation costs for your particular home. Take the ground measurements of your house, from corner to corner. Our calculator assumes that your house has rectangular shape. It cannot operate with odd shaped objects, so when you are plugging in the ground dimensions of your home, that is not rectangular, calculate the outer perimeter of your house and plug it in, multiplied by one. For example, you have an “L” shaped house that measures 50 x 25 feet for the main section of the house and 20 x 15 feet for the bump-out section. Calculate your outside wall dimensions – in our case it will be: 50′ (back side), 25′ + 25′ (sides of the main section), 30′ (front of the main section), and 15′ + 15′ + 20′ (sides and front of the bump-out section). Your total outside perimeter (length of the outside walls) is 180 linear feet. Plug in 180 x 1 into the calculator. PS. You can use the length of the outside walls to also get the pricing on soffit and fascia installation. This may be subjective, but try to estimate how difficult it would be to install the siding on your home. If you have a bunch of small bump-out sections, sun rooms, porches with sloped roof, and my favorite – old style bay window framed out as part of the house (not the one you can buy at Home Depot). All this things take considerable time and generate lots of waste, and therefore will cost more. Also, your cost per sq. ft. will go up, with the number of floors in your home. We did leave the 1 and 2 story homes the same, but three story houses (usually older triple-deckers) are fairly difficult, compared to a ranch house, and installing siding on them will cost more. When I was installing siding many years ago, subbing for Sears – I heard their sales men preaching the importance of insulation and how it will save millions of dollars on heating cost. It is true, but even a 1 inch extruded foam insulation will not do magic. It is best to have the cavities in your walls insulated by either roll insulation (Owens Corning style r-13 insulation that you see at Home Depot), Blown in or expandable spray-foam insulation. Putting up rigid board insulation on the outside walls is not the best method, especially if you are going over existing siding. To get best results form the insulation installed on the outside, you want 2 or even 3 inches of Poly-ISO insulation with aluminum foil facing, which in a way also works like radiant barrier. In this case you will get 13-20 R-value without opening up your sheet-rocks. This however will be a much more complicated project as you will need to attach the insulation and then install furring strips all around your house, so that you could then attach the siding. You will also have to deal with the fact that your siding sticks out by a couple of inches past all your doors and windows, and these openings need to be properly trimmed to keep the heat in and water out. 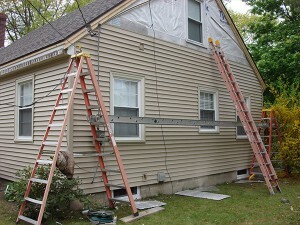 Stripping off the old siding is VERY uncommon, and is rarely done, as it is mainly a waste of money. It is actually better to leave the old siding on, as it adds some insulation R-value and acts as additional moisture barrier. It is necessary to remove any vinyl siding before you install new siding, as you cannot nail insulation and new siding over old vinyl. When you are installing new cedar siding, you also have to remove all siding off the walls of the house as you need flat surface to install new cedar. In other cases, I’d recommend leaving your old wood siding on, and not go through additional expenses and mess in the yard. When a new vinyl or composite siding is installed, it is recommended that you also include the window / door aluminum trimming. First, aluminum copping will protect the wood around your windows and doors from moisture, as well as hide the ugly chipping and peeling paint. There are many stiles of metal copping around the windows and doors and each contractor will have their own. You should discuss it with your installer. The two most common styles are “[” shaped metal put over the window trim, and sills, and J-channel installed around it, to receive the siding. Second style is more complicated and time consuming, but looks much better when done right. Metal trim is installed over the window trim, and has a J-channel built in. It is rather difficult to fabricate this type of window trim on your typical 10′ brake, but it is doable. It’s also fairly difficult to put it together and have all corners fit tightly and match. Also it may not be an option if you have window sill, unless they are modified. For the purposes of calculating the price of installing windows and door trims, we assume that you will be getting “[” shape metal with J-channel. The other type of metal trims is more aexpensive and each siding installer has different prices. When you are installing cedar siding – be it shingles or clap-boards – the trim around doors and windows is usually new 1×4 cedar board – no metal is use with cedar siding. You should still include the number of trims that you have, when calculating cost of cedar siding. Siding prices for calculated for .042″ Vinyl Siding, .048″ Premium Vinyl Siding, Hardie Board (and other similar composition siding), Red Cedar Shingles (Cape Code style) and Clapboard Cedar Siding. Siding Calculator software update – on Apr. 4, 2011 we made major update to the siding estimate calculator, and although some may not stand out right away, this update made the calculator a lot more accurate and can now differentiate between several types of homes/roofs such as Gable style home (Ranch, Colonial, Cape, Bungalow), Hip, Multiple Gables (Victorian type homes) and Raised Ranch house, as well as added roof pitch calculation to account for addition siding materials on low as steep slope roofs. Find out more about new features and options were added to siding calculator, to make in more accurate in estimating siding prices. I have a 50 square house to be siding, as red cedar siding how much should I charge per square. I am not sure about all the details, but 50 square siding job is pretty big, so I assume the house is rather cut up with a lot of details. Depending on the type of cedar siding you plan to use – shingles or clapboard – whether you plan to stain the siding or not, whether you are using the cedar breather or not, how much trim there is, etc., I would charge at least $1000 per square. Consider all the waste, cost of siding materials, and amount of work and labor costs + overhead that you carry and adjust your pricing. When we did our last cedar clapboard job, we got a super @nal customer, who wanted more than was in the contract. We still made money, but at $950 per square it was not enough to justify doing jobs like that again. We were there for over two weeks, so our labor cost was pretty high. Good luck. No matter how you look at it, that building / house has about 47-50 squares of siding to install. $5300 – really? You want siding installed with materials, window wraps / copping, insulation, insurance, gas, overhead, LABOR, for just over $100 per square? Width (gable side): 76 ft. So I don’t know where you got $53000, unless you want red cedar or composite siding. And again – for $100 / square??? Try pricing out JUST the materials for this job at home depot – you will be well @ $10,000 easy for vinyl siding. PS – I did notice that increasing the roof slope adds almost $4000, but that is because the calculator thinks the house is rectangular shape, and 76 ft. wide gable with 8 pitch roof, will add MANY squares to the total size. Bottom line Tony – I do know my siding prices – I’ve been doing it for many years. Even if the calculator has a little glitch here and there, it is still very accurate – for New England at least, but I did reduce the numbers to be more close to the national average. I have 15,000 sq ft to be sided with hardie. I’m trying to figure out how much board I need to buy. If you are going with a 4″ exposure, which is typical for hardie and other fiber cement boards as well as cedar clapboard siding, you will need about 45000 linear feet of board, plus waste, plus corner posts and window trim. Hope this helps. I think this is a great tool, thank you for providing it. I am putting an estimate for an insurance claim. I measured 25 square of sided area, the house is very cut up with steep roofs, a large shed dormer, two small gable dormers, bump ins and a garge perpendicular to the ridgeline of the house, three full gable and two partial gables(half of one is only fascia. The footprint measured 108’x32′ app. The adjuster thought that hardie plank lap siding would be comparable to what was on the house. What do you think? This seems to be a good calculator, thanks! Are soffits, and facia additional? I am estimating a cut-up two story chateau with dutch gables! have 2 foot wide soffits, and some tapered up to 40 inches! Facia is 1 foot wide. For vertical fiber cement siding you can use the prices on Hardie siding – it’s pretty much the same. Soffit and fascias are separate (or you can “include” them in the job) … I typically price them separately, and depending on what’s involved. Our calculator currently does not provide option to estimate soffit and fascia prices but I will add that function soon. When you estimate this one, use “Cut-up” difficulty setting for sure – this will compensate for all the extra labor involved. For “Roof/House type” use Victorian (4 gables) – this will cover the number of gables you have and the shed dormer / other dormers. I will be updating the online version of this siding calculator soon, to reflect things like dormers, shed dormers, soffit and fascia. This will be done once we release our Siding Calculator App for iPhone / iPad platform (very soon, as it is almost ready and we are hunting out the bugs in the software. BTW – with that app you can much better estimate siding prices on the go, instead of relying on somewhat limited functionality of our online calculator. I say limited, because you do not have the options to change things like waste, materials and labor costs and well as all other small things that our App will allow you to do. Example of the similar app is our Roofing Calculator app (for iPhone and Android platforms). Also you can see it in action in this Roofing Calculator App video on YouTube. PS – I’m a little unsure about your “Hardie plank lap siding” question – what kind of siding was on the house? what’s the going rate in Iowa? what are your costs and overhead? what type of siding material is it? 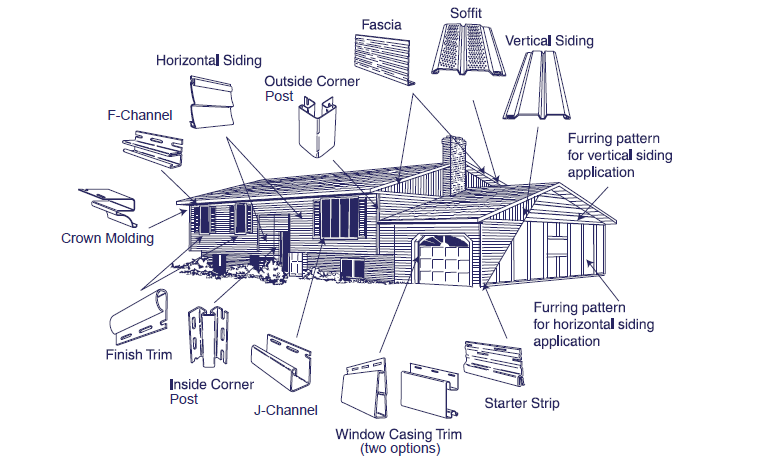 have you ever installed siding? hello, hope u could help me our house has had siding done from power home and remodeling, we have have had 4 subcontractors that they sent out here because they did not do a great job our original price that we contracted for was 23,000 for bella stone on the front, sm portion of side foundation, vinyl shakes on front, wrapped 12 windows, door, gutters it is a ranch style house w/ garage under one of bedroom so slightly higher there. we had insulation that matched w/ the shakes Styrofoam, and it was wrapped w/ rain wicking type wrap. we did not contract for the soffets but they brought here we assumed d/t the long wait after commitment start. they started 1 wk w/ no call no show, then we were told by PH they were going to start and they came and said they didn’t have nails so they weren’t going to start, next 2 days no show/no call, we had to call PH again and they came to our house the day we were having a bday party for my son, we had a huge dumpter that took the whole driveway up that was their for a week and nothing done, of course we complained, then they send the 2nd crew fired the first (they had told them they had the house half done)lol. 2nd crew was good, for most part we were happy a couple days no show no call, rain days we expected that,and the shutters were put upside down,then one day they show up take their stuff and we asked them if they were working today and they said nope, and left, then they send a 3rd crew and they worked one day, stood on our hot tub cover denting it, got in a little argument w/ my husband, had a urine bucket either dumped or whatever in the front of the house that day after they left,( huge stain that smelled like urine in street in front of house where their van was) the octogon gable was off of the peak of the house, their was a buldge in the siding in the small area they put up, and the metal wrapped around the few windows they did was so off it was horrible. so the project manager came and assessed things that we werent happy and he pulled down the siding where the buldge was and their was no insulation behind a huge area, so we weren’t happy about that, (we even had to tell them that they needed to replace some wood that was rotted they would have just put siding over it, the project manager started pulling down stuff that wasn’t done right and redid and put insulation where needed and wasn’t. So the bosses of the project manager that was put on ended up having just the project manager working on house, himself, d/t he was the only one who at the time seemed to be trusted. At most he did a good job, and we were communicating w/ the people in pennsylvania big bosses about how unhappy we were. then he was putting on bella stone, and it cause it was taking a long time they wanted him just to finish the bella stone and leave. then they weren’t happy how long it was taking it for him to do himself so they took him off the job and had another subcontractor come and finish sm things that were found that were done wrong, the gutters leaking not put up right. facets not cut and put up correctly. How much do u pay when in a contract it states to be done 2-5 days, and it started aug 23 and now it is nov 3 they offered 11,000 w/o life time warranty, and 14 w/ warranty, is this fair, or w/ all the stuff aggravation, us having to find things wrong, them not sticking to the contract. what are we aloud to refuse to be paying?? As far as what you should pay them – $11K w/o warranty or $14K w warranty. I think $11K, because if something goes wrong in the future, you can always get a good local siding contractor to fix it, and $3000 that you will save, will give you a pretty good buffer for possible future repairs, especially that their project manager already fixed most thing, and as you said, he did a fairly good job. I’m not sure how your building codes work, but here in MA, a contractor is responsible to fix installation defects for at least two years after installation. I think if you go into $11K option, they still have to warranty your job for 2 years. Still, I would consult with your attorney, just to be sure, and/or try to talk them down to $12K with warranty. It’s pretty complicated, but you are getting a “$23K” job for $11K… but maybe a local non-sub contractor would do it even cheaper. But once again, I don’t know the total scope of work, and if original price was fair. P.S. it is very important to have your answer ASAP. I will help you with this. We built the functionality to calculate both Vinyl / Aluminum and Non-vinyl siding into the app, but because calculating them works differently, you will need to do it in the following way. First – our app calculates Cedar / Fiber siding in the same manner (read details below). To calculate Fiber Cement, you will first need to create a new Siding Material profile – call it “Fiber Siding” or something like that. Next, you will need to put in your cost and prices. Here is one important step you need to make – on the second line in the profiles, where it says “Siding Type”, move the slider to ON position (it is off by default). The ON position will tell the calculator to use NON-VINYL trim when calculating prices. By default it uses data from vinyl trim section, and calculates J-Channel and other vinyl-specific trim (for example, adds two pieces of J-Channel for every window in the house). In the non-vinyl trim section, it uses 10-foot long 1×4 boards (2 for every window, 3 for every door and 4 for every large window / bay window). I assume that with fiber siding you will use some type of PVC or wood boards to trim out the windows / doors, etc. So when you enter prices for non-vinyl trim, assume the price for two 1×4 boards for windows, or 3 for doors. We also included in this calculation the “fact” that you will run boars trim around the base of the house (at the bottom). Hopefully this helps. I will email you the copy of this. If you are still having issues, I will include my phone in the email. hello I recently moved to Georgia and spend about 6000 on a trailer fully equiped for siding , but there is one problem my cousin is the one that knows the trade, i don’t .Is there any website that u could recomend that can give me a better insight of the trade or books that can explain the codes and regulations?.I have done construction but never this I’m a pipefitter and do fire sprinklers for a living,but sidings first time in GA, florida almost never uses this. PS I have an android can i download ur app to that phone or does it have to be an Iphone? I live in a condo building where the top level has a pop up with one wall that needs siding to be replaced. If it is a 2 story wall, and is roughly 30 feet long,with one sliding glass door, what would a rough estimate be on having new siding installed? Thanks in advance for your help. In Florida, I have approx 700 sq ft of stucco to remove,sheeting under it is rotten.Stucco and roof has been cracked and leaking for years before the house was bought by this lady.Then re-sheet it and put vinyl siding with 1/4 in. foam core on.Off grade house, 9 or 10 windows and 1 door, 2 small gables(3 or 4 pitch)roof.Soffit and fascia and about 60 ft of 1×6 to install.All the windows are going to have to come out when I take the sheeting off and be re-installed,also.Gonna be nasty.How much should i charge on something like this? Most of these changes are now being added and should be available for update through app store in 3-4 weeks. You have the 1st section which is the main building with 4 walls. You can add additional sections and choose between 3 and 4 walls (3 if structure is attached to main building and 4 if it is a stand-alone structure. You will be able to specify the number of blocks / light mounts / water spigots / dryer vents / gable vents. The j-channel will still be calculated the same way, but I will try to implement “Additional J-channel” on top of normally-calculated. Also we are adding saving and exporting functionality, as well well as GPS location. Most of these changes were already added to our Roofing Calculator app for iPhone / iPad, and work on Siding Calculator update is underway right now. If we can do it faster, we will. But there is also an average of 7-10 days that App Store will add for app approval. I think this is a great tool for individuals to get a ballpark idea of what they are looking at as far as siding prices. I’ve been installing siding in the Kansas City area for over 25 years, and will direct potential customers to your app. Thank you for your service. I am dealing with a two story home with T1-11 on three sides and the bottom edges of the siding took a hit and are water damaged up approximately 8″. The rest of the siding is not in too bad of shape except that it needs to be re-nailed. As an alternative to replacing all the siding my plan is to cut out the bad edges and install flashing and belly band all the way around probably using 5/4″ x 10″. Do you have a labor and materials formula for this and advice for avoiding trouble. By the way, biding another house where your siding calculator is being very helpful but the house has a shellacked, Mahogany 4″ lap siding on it and finding a comparable material that will withstand the elements a bit better is a challenge. Your calculations are way off! It said $16,000 and change to do hardie siding on a 50’x 28′ simple 1 story house. I priced the materials out myself at home depot and it will cost me well below $5000 total! I have damp over my windows, could this be because my guttering at the front of my house is leaking? Copyright - SidingCalculator.org - All rights reserved.